The package has been precisely designed by us to help our clients have a comfortable full day travel experience in Nasik. We offer this service for local city uses. You can get details from our official website. 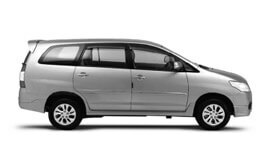 Local Full Day service at My Taxi India has been designed to suit a number of purposes including sightseeing, attending meetings, shopping, seminars, visiting hospitals, and a lot more. We have a special plan for those who are short of time. It is available for Airport Transfer in Nasik, party and event, Car rental service for Marriage, Corporate Cab Rental in Nasik, Railway Transfer, visiting hospitals and a lot more. This is a typical pickup and drop service offered in and around Nasik just according to the demand of our clients. Once you book a service, we make sure our trained chauffeur reaches the appointed destination on time. Our premier transfer taxi rental services are available for airport pickups and drops, railway station pickups, hotels pickups and drops, bus stand pickups and drops. You can avail these services from Nasik to your desired destinations. This is a highly advanced and meticulously designed service offered for variety of purposes such as trip with friends, excursions, weekend getaways, and family leisure trip outside the city limits. If you are simply looking for a to and fro taxi facility to Nasik visitors, get in touch with us. We offer a specially devised roundtrip hire service for several destinations from Nasik. This service is available to your desired destinations starting from Nasik. If you wish to visit more than one city at a given point of time, book our multi city travel hire service. Our exclusive multi city package will make your tour comfortable and an exciting experience for a life time. If you are interested in booking a tour that takes care of your requirements precisely and fits into your budget too, reach us to get one customized one. We guarantee the best car rental services in Nasik at highly affordable prices. The weather of Nashik district is characterised by dryness except for the south-west monsoon season. The year may be categorized into four seasons; summer, winter, monsoon and post monsoon. The cold season prevails from December to February. This is followed by the hot season starting from March to May. The city also experiences the south-west monsoon season from June to September. Thereafter, Nashik gets post-monsoon season during October and November. As per official census report for the year 2011, Nasik District has a population of 1,480,769 residents. Nashik is an industrial city. The Hindustan Aeronautics Limited aircraft manufacturing plant employs over seven thousand people. The Currency Note Press and Indian Security Press are also located in Nashik Road. This is where the Indian currency and government stamp papers are printed. Nashik is also emerging as one of the hottest business process outsourcing (BPO/IT) destination. It is home to some celebrated IT companies. Other sources of revenue in the city include textile industry and the 36 top-notch wineries. Nashik is a beautiful city in western India, Maharashtra state. It is widely known for many tourist attractions such as the Shree KalaRam Mandir, the Artillery Centre, Pandav Caves, NandurMadhmeshwar, Trimbakeshwar Temple, Igatpuri, Dhammagiri, Coin Museum, Saptshrungi Gad, Shree Saptshrungi Devi, Naroshankar Temple, Bhandardara and Kalsubai Peak, Veer Savarkar Smarak, Gondeshwar Temple, Teertharaj Gajapantha, and many more.